Before any bird ever took flight, a different kind of creature ruled the sky. Pterosaurs, evolving 220 million years ago and a contemporary of the dinosaur, were among nature’s first fliers. They ranged in size from modern-day pigeons to “small airplane[s]”, the largest weighing up to a quarter ton. When they were on the ground they stood upright, on all four legs. For a long while, the flight of these animals baffled paleontologists and biologists. Something that large shouldn’t be able to fly. But the more we learn about these ancient pterosaurs, the more it seems that they aren’t that different from the creatures in the sky today. It had previously been though that pterosaurs had a rigid bone structure. Consequently, it would have a harder time drawing in oxygen and generating enough power to stay in the air. But researchers at Holy Cross and the University of Leicester were lucky enough to examine an intact ribcage, giving a better perspective on how these animals were built. As it turns out, pterosaurs’ bone structure shares many similarities with modern-day birds. 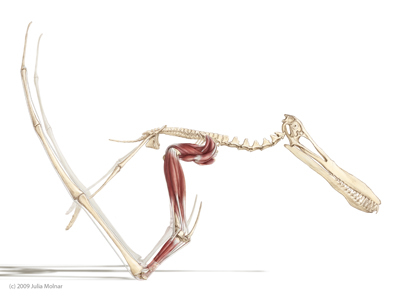 Air sacs connected to the creature’s lungs ran through its limbs to its outermost extremities, allowing for more efficient respiration and a lighter skeleton. Interestingly, it seems that the pterosaur would’ve been able to use the air sacs to change the shape of its wings, perhaps in the same manner a bird sweeps its wings to adjust the lift and drag being produced. But pterosaurs did not fly like birds; they were simply too large and their wings couldn’t produce enough lift to take off from a stationary start. Instead, researchers at Chatham University think that their anatomy suggests that they vaulted into the air, utilizing all four limbs. Today, vampire bats take off in the exact same way, using their forearms. As with the pterosaur, this allows them to take off without a cliff or running start. Both the pterosaurs’ hollow bones and vaulting takeoff are amazing examples of convergent evolution. Before birds took to the sky, reptiles had developed the same lightweight skeletal structure, 70 million years earlier. Before any bat had propelled itself using its front limbs, pterosaurs had already mastered the technique. Although all of these creatures are very genetically different and evolved millions of years apart, all developed very similar traits. It seems that when nature wants to get a creature up in the air, it sticks to the tried and true. Did Giant Pterosaurs Vault Aloft Like Vampire Bats? I have to apologize for a second pterosaur post, I had started this one awhile ago and just had never finished. The picture really helps to put things into proportions! Nice ending! By the way, there is plenty more to say about pterosaurs than fits in one blog post, so no worries. I would love to see a CG animation of the pterosaur’s vaulting take-off. It’s so hard to imagine a pterosaur the size of an airplane. They must have jumped off some really high places.